The San Diego waterfront will come alive on Friday, December 26, when the 24th annual Port of San Diego Big Bay Balloon Parade makes its way down North Harbor Drive. Kicking off at 3pm in front of the County Administration Building, the parade proceeds south on North Harbor Drive and ends where North Harbor Drive meets Pacific Highway, near Seaport Village. This year's parade theme is "Forever Young" and the grand marshal is Meb Keflezighi, the Eritrean-born American long distance runner. Keflezighi is a San Diegan, having attended Memorial Academy and San Diego High School and was a silver medalist in the 2004 summer Olympic Games and won this year's Boston Marathon, the first American male to do so since 1983. 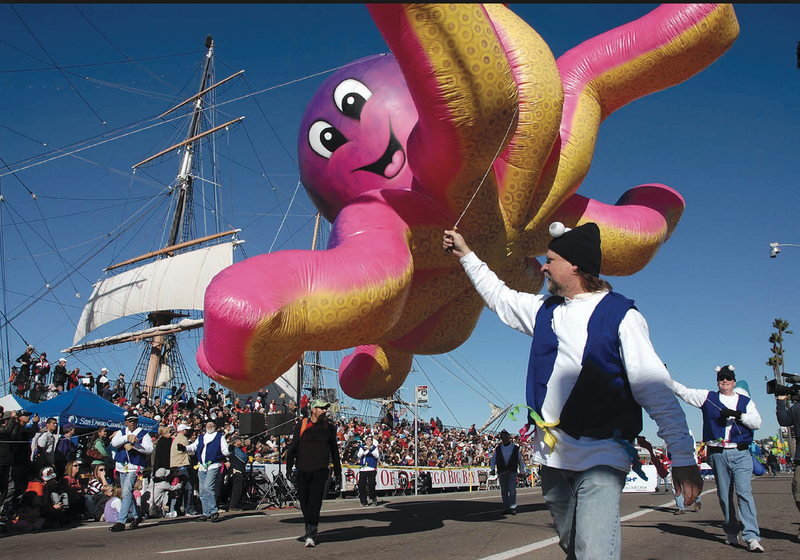 The Port of San Diego is the title sponsor of the parade, which is often referred to as "America's Largest Balloon Parade" because of the number of giant inflatables. There are 28 this year. There will also be nine bands, including the USC Trojan and University of Nebraska Cornhusker marching bands. Seven floats and several specialty units will complete the lineup. 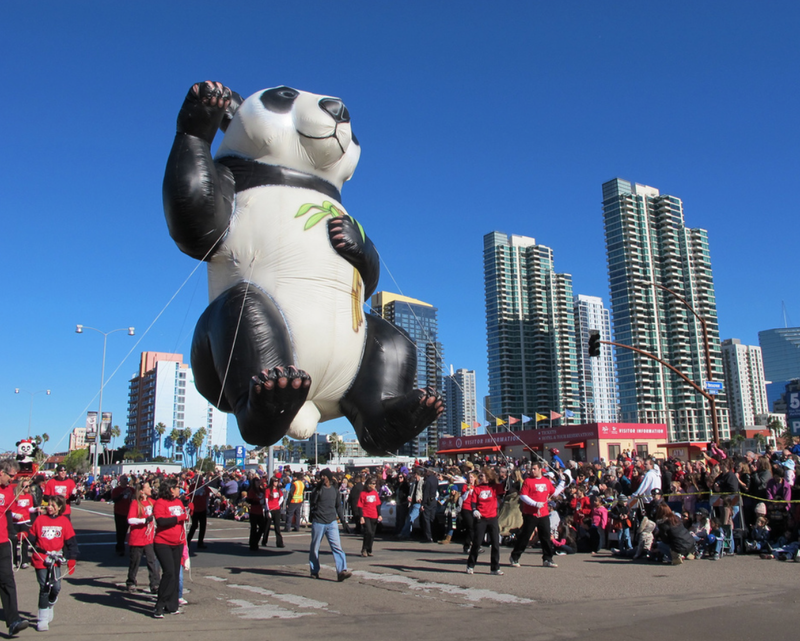 The parade is one of the many activities leading up to the 2014 National University Holiday Bowl game between the USC Trojans and the University of Nebraska Cornhuskers, which takes place at Qualcomm Stadium at 5pm on Saturday, December 27. Other pre-game and pre-parade festivities include the Wienerschnitzel Wiener Dog National Finals, which pits eight of the fastest dachshunds from all over the Western United States against each other. The race begins at 2:30pm on Friday, December 26 in front of the Maritime Museum of San Diego, 1492 North Harbor Drive. Also happening on December 26 is the Bumble Bee Seafoods 5K race. Runners will start off in front of the Wyndham San Diego Bayside Hotel, 1355 North Harbor Drive. The race proceeds south on North Harbor Drive to 8th Street, travels behind the Convention Center and finishes at Ruocco Park near G Street. Parking for the parade is extremely limited and the Port of San Diego encourages carpooling or the use of public transportation. The San Diego Trolley has convenient stations with service to the Harbor Drive and embarcadero areas with free and paid parking lots. These are located at the Fashion Valley, Old Town and America Plaza stations. Street closures for the parade begin at 12:45pm on Friday, December 26 and include North Harbor Drive from Grape Street to Pacific Highway. Pacific Highway will have one southbound lane closed from Grape to Ash Street, beginning at 12:45pm Pacific Highway from North Harbor to Broadway will be entirely closed beginning at 12:45pm. All streets will reopen at approximately 5:30pm. For more information on the San Diego Big Bay Balloon Parade, visit sandiegobowlgames.com/parade.